A Reliable Fax with True Business Power. Simple but Trustworthy True Business Power is Here. The Panafax UF-5950 inherits the real business power that has made the Panafax name synonymous with business faxes. Amazing, in spite of being small enough to fit easily on your desk, the UF-5950 comes loaded with all the features and functions you'd expect from a top of-the-line business fax, not to mention Super G3 fax transmission. 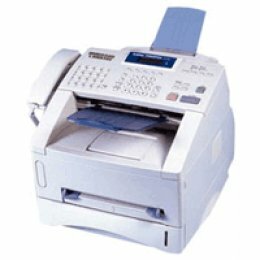 Even with high volume transmissions and reception, the UF-5950 easily handles any fax job. Offering true business-level performance, the UF-5950 is not only durable and highly reliable, it is also economical and practical. Count on the Panafax UF-5950. The simplest solution to your business fax demands. 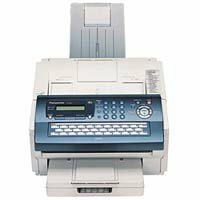 High-speed Super G3 Fax Transmission with Quick Memory Transmission, the UF-5950 dials as soon as the first page has been scanned even when sending a large, multi-page document. With its high-capacity 8 MB document memory, the UF-5950 can store up to 480 pages. This allows it to easily handle several high-volume jobs at once, so you'll never have to wait around. Thanks to our Energy Saver technology, the UF-5950's power consumption has been reduced to a mere 1.2 Wh in the sleep mode.